42 • May 2018 • S I G N & D I G I T A L G R A P H I C S WRAPS DIGITAL GRAPHICS Simple Robert Iger, CEO of The Walt Disney Company, once said, "Keeping it simple for the consumer is incredibly dire." Incredibly dire may sound a bit extreme, but in the case of vehicle wrap design it's really apropos. There are two consumers in this case. The consumer purchasing the vehicle wrap (your customer), and the consumer who will view the wrap advertisement (and hopefully purchase from your cus- tomer). The effectiveness of the design ulti- mately benefits or harms your customer's advertising campaign. A simple design that quickly impacts the consumer is of dire importance in a visually noisy market. 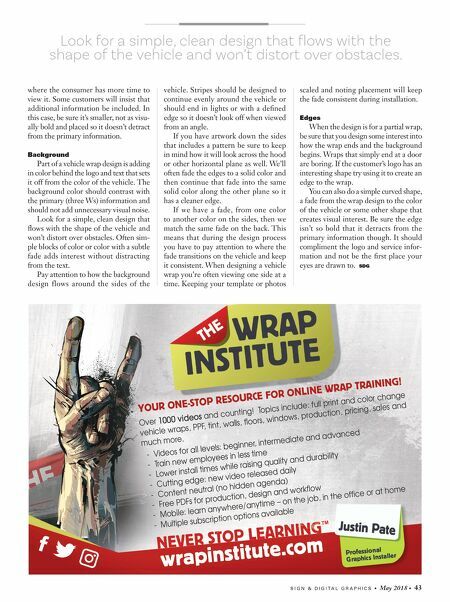 The Three W'S I've discussed this in more depth in a previous article, but "The Three W's" of wrap design are the starting, and some- times ending, point of what we include on our wraps. Here they are: • Who you are • What you do • Where you're located "Who you are" would include the company name or logo. This logo should reinforce what the company does even if the consumer doesn't have time to read the tagline. "What you do" is this tagline, slogan or statement of what the company does. Often what the company does is already part of the name/logo. If the slogan says something unique, reinforces the brand or highlights a special service then defi- nitely add it in. If it's a repeat of the ser- vice already stated within the logo then leave it off. "Where you're located" is the contact information. If you have a professional website in place then highlight this. Usually a URL is easier to remember and the consumer can get the phone number from the website. If there is no website, or it isn't up to snuff, then include the phone number primarily. Strongly dis- courage the customer from including more than one phone number. All additional information is consid- ered secondary/extraneous information. 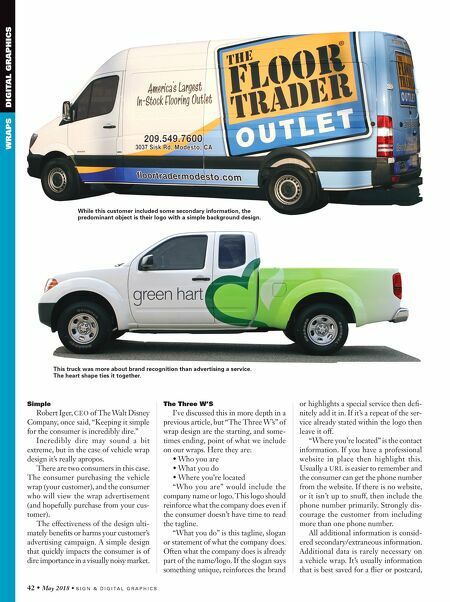 Additional data is rarely necessary on a vehicle wrap. It's usually information that is best saved for a flier or postcard, While this customer included some secondary information, the predominant object is their logo with a simple background design. This truck was more about brand recognition than advertising a service. The heart shape ties it together.